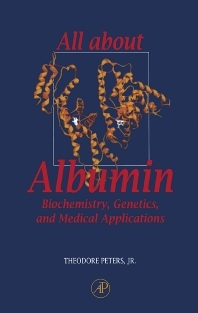 The first of its kind, All About Albumin summarizes the chemistry, genetics, metabolism, clinical implications, and commercial aspects of albumin. It provides the most up-to-date sequences, structures, and compositions of many species, and includes more than 2000 references. Biochemists, clinical chemists, pharmacologists, molecular biologists, biomedical researchers, geneticists, physiologists, and nutritionists. A Historical Perspective. The Albumin Molecule: Its Structure and Chemical Properties. Ligand Binding by Albumin. Genetics: The Albumin Gene. Metabolism: Albumin in the Body. Clinical Aspects: Albumin in Medicine. Practical Aspects: Albumin in the Laboratory. Subject Index. The Mary Imogene Bassett Hospital, Cooperstown, New York, U.S.A.